Australopithecus africanus is an extinct (fossil) species of the australopithecines, the first of an early ape-form species to be classified as hominin (in 1924). Recently it was dated as living between 3.3 and 2.1 million years ago, or in the late Pliocene and early Pleistocene times; it is debated as being a direct ancestor of modern humans. A. africanus was of slender, or gracile, build and has been found only in southern Africa at four sites: Taung (1924), Sterkfontein (1935), Makapansgat (1948) and Gladysvale (1992). In January 2019, scientists reported that Australopithecus sediba is distinct from, but shares anatomical similarities to, both the older Australopithecus africanus, and the younger Homo habilis. Raymond Dart, then the head of the department of anatomy at the University of the Witwatersrand in Johannesburg, South Africa, became interested in fossils found at a limestone quarry at Taung near Kimberley, South Africa in 1924. The most promising of these was a skull of an odd ape-like creature presenting human traits at the eye orbits, teeth, and, most importantly, the hole at the base of the skull over the spinal column (the foramen magnum); its placement indicated a human-like upright posture and implied a high probability that this hominid-to-hominin primate had achieved bipedal, as opposed to quadrupedal locomotion. 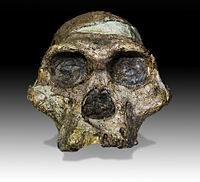 Dart assigned the specimen the name Australopithecus africanus ("southern ape of Africa"); it was also dubbed "the Taung child". Sir Arthur Keith was an anatomist and anthropologist fellow in 1924, and a scientist whose personal prejudice looked to Europe—not to Asia or Africa—as the place where the early hominins would be shown to have emerged. He dismissed Dart's claim, suggesting instead that the Taung child skull belonged to a young ape, most likely an infant gorilla or chimpanzee. Keith's persistence in denouncing the possibility of Australopithecus while justifying the plausibility of Piltdown man was instrumental in binding the two issues inextricably together for over a generation. Keith immersed himself in defending the Piltdown man and his reputation suffered greatly after the hoax was exposed in 1953. Phillip Tobias, in a lengthy essay published in Current Anthropology in 1992, detailed the history of the investigation of the hoax. He presented argument that implicated the motive of Keith's adamant and continual opposition to Australopithecus, to wit: if Australopithecus was a hominin ancestor, then Piltdown man could not have been and its bona fides would have been suspect and called out for formal investigation. As part of the essay Tobias debated the inconsistencies in Keith's statements and actions with contemporary members of the science community. Keith's persistent animus towards the Taung child discovery caused serious consequences; from Dart's announcement in 1924, it took nearly 30 years before the methods of science revealed the Piltdown man hoax and supported the validity of the claims (of hominin status) for Australopithecus. 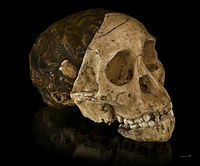 Dart's theory—that the skull known as the Taung child was a human ancestor—was supported by Robert Broom, a paleontologist with the Transvaal Museum of natural history in Pretoria. In 1936, the Sterkfontein caves yielded the first adult australopithecine, substantially strengthening Dart's claim for Broom. 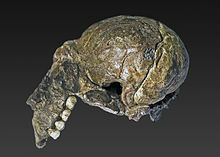 Later, Broom classified an adult endocranial cast having a brain capacity of 485 cc (found by G. W. Barlow) as Plesianthropus transvaalensis (near-man from Transvaal). In April 1947, while blasting at Sterkfontein, he and John T. Robinson discovered a skull belonging to a middle-aged female (catalogue number STS 5) which he also classified as Plesianthropus transvaalensis (it was dubbed "Mrs. Ples" by Broom's young coworkers although the skull is now thought to have belonged to a young male). Both fossils were later classified as Australopithecus africanus. Mrs. Ples, whose cranial capacity is only about 485 cubic centimetres (cc), was one of the first fossils to reveal that upright walking (bipedal locomotion) had evolved well before any significant growth in brain size. And, in comparison to modern apes, Dart noted as with the Taung child the lack of facial (prognathous) projection, a characteristic shared with advanced hominines. In 1997, paleoanthropologist Ronald J. Clarke began extracting the remains of a near-complete skeleton of Australopithecus named Little Foot (StW 573), which was previously discovered in the cave system at Sterkfontein; extraction or preparation and analysis of the specimen has been nearing completion in 2018. Little Foot is currently classified as (lumped into) Australopithecus africanus; Clarke suggests that Little Foot doesn't belong to either species afarensis or africanus, but to a unique Australopithecus species found at Makapansgat and Sterkfontein (and named Australopithecus prometheus by Raymond Dart). Analysis made in 2015 by a new radioisotopic technique dated the Little Foot specimen to about 3.7 mya. A. africanus was similar in many traits to A. afarensis, a bipedal hominin with arms slightly longer than the legs (a physical trait also found in chimpanzees). It has slightly human-like, advanced cranial features (seen in the crania of Mrs. Ples and STS 71), but also presents primitive features including ape-like, curved fingers adapted to tree climbing. Instead of it being a direct ancestor of later hominins and thereby of humans, some researchers believe that A. africanus evolved into Paranthropus, and specifically that P. robustus descended from A. africanus. Both P. robustus and A. africanus crania seem very alike despite the more heavily built (robust) features of P. robustus, which, like those of the modern gorilla, are adaptations for heavy chewing. A. africanus, on the other hand, had a cranium which quite closely resembled that of a modern chimpanzee; yet both brains measure about 400 cc to 500 cc and probably presented an ape-like intelligence. A. africanus had a pelvis that would enable more efficient bipedalism than that of A. afarensis. A 2015 study of hand bones in A. africanus indicated the species had a "human-like trabecular bone pattern in the metacarpals consistent with forceful opposition of the thumb and fingers typically adopted during tool use". Such a morphology would support an earlier time for making and using tools than previously had been thought likely. Evidence of human-like sexual dimorphism in the lumbar spine has recently been described in the (bipedal) primate A. africanus. This character of morphology has been seen as an evolutionary adaptation by female bipeds in order to more efficiently bear load on the lumbar column during pregnancy, an adaptation that non-bipedal primates do not need. 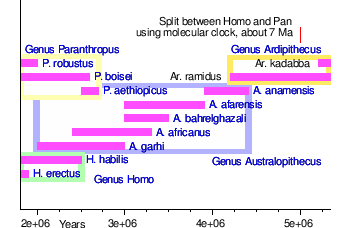 A 2011 study using ratios of strontium isotopes in teeth suggested that both A. africanus and P. robustus groups in southern Africa were patrilocal: that is, females tended to settle farther from their region of birth than did males. Recent analysis of the Little Foot specimen dated it to about 3.7 million years old, which gives support to the claim by Ronald Clarke that it is of the previously unknown species with characters similar to Paranthropus robustus and named Australopithecus prometheus. Instead, the specimen has usually been lumped into A. africanus by most scholars. Earlier dating had placed it between 3.0 and 2.0 mya based on combined analyses of palaeomagnetism, electron spin resonance, and faunal dating. The Makapansgat fossils have been dated to between 3.0 and 2.6 mya. Those at Sterkfontein currently are dated to between 2.6 and 2.0 mya with the Mrs Ples fossil dating to around 2.0 million years. And Gladysvale fossils were dated between about 2.4 and 2.0 mya. The age of the Taung child remains more difficult to determine and is the focus of a current dating project. ^ a b c d "Australopithecus africanus". archaeologyinfo.com. ^ "Human Evolution by The Smithsonian Institution's Human Origins Program". si.edu. ^ Dartmouth College (17 January 2019). "Understanding our early human ancestors: Australopithecus sediba". EurekAlert!. Retrieved 21 January 2019. ^ "Raymond Dart and our African origins". uchicago.edu. ^ "Biographies: Raymond Dart". talkorigins.org. ^ K. Kris Hirst. "John T. Robinson". About.com Education. ^ Geggel, Laura (December 11, 2018). "'Miracle' Excavation of 'Little Foot' Skeleton Reveals Mysterious Human Relative". Live Science. Retrieved December 11, 2018. ^ Clarke, R.J., (2008) "Latest information on Sterkfontein's Australopithecus skeleton and a new look at Australopithecus"; South African Journal of Science, Vol 104, Issue 11 & 12, Nov / Dec, 2008, 443–449. See also "Who was Little Foot?" The Witness, 20 March 2009. ^ Bower, Bruce, (2013) "Notorious Bones"; Science News, August 10, 2013, Vol. 184, No. 3, p. 26. ^ a b Gardner., Elizabeth K.; Purdue University (April 1, 2015). "New instrument dates old skeleton before 'Lucy'; 'Little Foot' 3.67 million years old". Science Daily. Retrieved April 3, 2015. ^ Skinner MM; Stephens, NB; Tsegai, ZJ; Foote, AC; Nguyen, NH; Gross, T; Pahr, DH; Hublin, JJ; Kivell, TL; et al. (2015). "Human-like hand use in Australopithecus africanus". Science. 347 (6220): 395–399. doi:10.1126/science.1261735. PMID 25613885. ^ The Independent's article A pregnant woman's spine is her flexible friend, by Steve Connor from The Independent (Published: 13 December 2007) quoting Shapiro, Liza Archived 2008-01-25 at the Wayback Machine, University of Texas at Austin Dept. of Anthropology about her article, Whitcome, et al., Nature advance online publication, (2007) doi:10.1038/nature06342. ^ Why Pregnant Women Don't Tip Over. Amitabh Avasthi for National Geographic News, December 12, 2007. This article has good pictures explaining the differences between bipedal and non-bipedal pregnancy loads. ^ Copeland SR; Sponheimer, Matt; De Ruiter, Darryl J.; Lee-Thorp, Julia A.; Codron, Daryl; Le Roux, Petrus J.; Grimes, Vaughan; Richards, Michael P.; et al. (2011). "Strontium isotope evidence for landscape use by early hominins". Nature. 474 (7349): 76–78. doi:10.1038/nature10149. PMID 21637256. ^ Bruxelles L., Clarke R. J., Maire R., Ortega R., et Stratford D. – 2014. - Stratigraphic analysis of the Sterkfontein StW 573 Australopithecus skeleton and implications for its age. Journal of Human Evolution. ^ "New stratigraphic research makes Little Foot the oldest complete Australopithecus". phys.org. ^ =Herries, A.I.R., Shaw, J. 2011. Palaeomagnetic analysis of the Sterkfontein palaeocave deposits; age implications for the hominin fossils and stone tool industries. J. Human Evolution. 60, 523-539. ^ =Herries, A.I.R.., Hopley, P., Adams, J., Curnoe, D., Maslin, M. 2010. Geochronology and palaeoenvironments of the South African early hominin bearing sites: a reply to ‘Wrangham et al., 2009: Shallow-Water Habitats as Sources of Fallback Foods for Hominins’ Am. J. Phys. Anthro. 143, 640–646. Wikimedia Commons has media related to Australopithecus africanus.